Mostly from Monday’s Lone Star Project news roundup email. AP: Texas Democrats offering stark contrast. Texas voters won’t have a hard time telling the difference between the Republican and Democratic candidates next year. The Democrats lost dramatically in 2002 and haven’t won a statewide elected office since 1994. But this year they are banking on delivering more supporters to the polls, while Republicans are relying on a dependable conservative base that has kept them in power for 20 years. Democrats have a long way to go to win in 2014, but no one can say they’re not offering Texas voters a distinct choice. Not sure what “more announcements to come” is referring to. The story also mentions AG candidate Same Houston. We usually think of down ballot races benefiting from the top of the ticket, not the other way around. But in the case of Wendy Davis’ gubernatorial run, the only shot she has of winning is in getting Latino support, and if anyone can get that support it’s LVP as her lieutenant governor. Senator Van de Putte is a Latina political leader with deep state ties and a national presence. Here in South Texas she has a finely tuned political infrastructure that will be crucial for the Davis ticket. As a co-chair of the 2008 Democratic National Convention and past president of both the National Conference of State Legislators and the National Hispanic Council of State Legislators LVP has a healthy rolodex to aid her fundraising efforts. “LVdP will help boost Latino turnout in 2014” is one of two themes you see running through these stories, and it’s likely one you’ll see over and over again for the foreseeable future. I believe LVdP will have a positive effect on Latino turnout for the Dem ticket, and I agree that that is a necessary condition for victory, but no one with a realistic view of the situation believes it is sufficient. Wendy Davis et al will also need to do at least a little better among Anglo voters, which is why there is also a focus on suburban Anglo women. “I think she’s going to be a plus to the party, to the ticket,” said U.S. Rep. Henry Cuellar, D-Laredo. 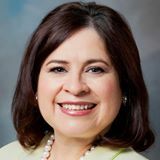 Cuellar’s district includes Starr and western Hidalgo counties as well as parts of Van de Putte’s state Senate district, which she has held since 1999. Javier Villalobos, the Hidalgo County Republican party chair who’s said he would not seek another term, offered a verbal shrug when asked prior to the announcement what Van de Putte’s candidacy would mean for voters in the Valley. But another partisan opponent believed Van de Putte could change the race. “Texas Sen. Leticia Van De Putte is a formidable candidate that presents long term challenges to the Texas GOP,” tweeted Aaron Peña, shortly after Saturday’s announcement. “Take note.” Peña is a former state representative from Edinburg who now chairs the Texas Hispanic Engagement Team for the Republican National Committee. As a Latina — albeit without the benefit of a common Hispanic surname — Van de Putte could appeal more to Latino voters than whichever of the four leading Anglo males emerges from the Republican primary. “She will be able to draw out the Hispanic vote,” state Sen. Juan “Chuy” Hinojosa, D-McAllen, said. But again, Republicans said that claim might be exaggerated. “Friends of mine who are Democrats don’t even know that Van de Putte is a Hispanic last name,” said Roman Perez, the vice president of the Republican Club of Brownsville. He added that even in the last election cycle, when Democrats nominated Linda Chavez-Thompson for the same spot, it didn’t significantly impact the race. Regardless of her name, Van de Putte represents the type of an experienced, centrist candidate Peña would like to see more of in his own party. “Sen. Van de Putte is going to present challenges to a Republican Party that, in my opinion, is not moving fast enough to confront a changing Texas,” he said. It’s adorable seeing Aaron Pena discover that his new Republican buddies aren’t exactly with him on the things he claims to value, isn’t it? I assure you, Aaron, no one could have predicted that. As far as the turnout predictions go, excitement and engaging voters are a big part of it, but so are getting the message out and good old GOTV efforts, both of which require a certain level of funding. The bit in the previous story about LVdP’s national connections and her potential to be able to raise the kind of funds she’ll need to operate a full-scale campaign is encouraging. I don’t know how much she might be able to raise between now and the January finance report, but I sure hope she’s burning up the phone lines. However, as Slater and other Austin watchers well know, Dream Ticket I was crushed in the 2002 election. The three top Democrats running that year — Laredo businessman Tony Sanchez for governor, former Dallas Mayor Ron Kirk for U.S. senator and former state Comptroller John Sharp for lieutenant governor, a Hispanic, an African-American and an Anglo — and all Democrats running for statewide office, lost. Gov. Rick Perry, running for his first four-year term, buried Sanchez with 58 percent of the vote while Texas Attorney General John Cornyn and Land Commissioner David Dewhurst, running for the first time for their current posts, beat Kirk and Sharp with 55 and 52 percent respectively. What gives today’s Democrats hope Dream Ticket II will fare much better — and possibly win in 2014 — is Davis and Van de Putte have the charisma and passion their three 2002 predecessors, particularly Sanchez and Sharp, lacked. Yep, the Dream Team, an irresistible analogy and comparison for this year that we likely won’t escape any time soon. Thankfully, Enrique Rangel provides the short answer why this year’s lineup is not like 2002’s. I have a high regard for Van de Putte as a politician, who earned a spot on this year’s Ten Best legislators list. She is no ideologue. She’ll work with the other side — and did so during the regular session, when she joined forces with Rick Perry to push for more rigor in House Bill 5. She’ll be an asset to Wendy Davis on the Democratic ticket, and she’ll be a worthy opponent for whoever wins the Republican primary. One of the problems for Democrats is that in counties with large Hispanic populations, particularly in South Texas, the primary is where the action is, not the general election. In the Rio Grande Valley, the races that motivate are those for local positions — city councils, school boards, and courthouse jobs. The elections frequently come down to a battle of one prominent family against another. The turnout issue again, in a slightly different form. The ingredients are there, or at least can and should be there, to make it happen. We’ll likely have a pretty good idea of how it’s all coming together well before anyone casts a vote. You’re of course right on Davis needing to “expand the race” to white suburbanites. That means finding more issues on which to campaign. Per Perry’s post last week about malfunctioning gas pumps, government competence is an easy, non-ideological one, and one with a two-decade state GOP track record. Good roundup, Charles. I just tweeted it to my followers. Many of us non-Texas Dems are watching Wendy and Leticia’s campaigns very closely.